Fiction – paperback; Quercus; 340 pages; 2012. Review copy courtesy of the publisher. Chris Womersley’s Bereft is a beautifully realised tale about a Great War soldier returning to his homeland to right a terrible injustice done to him and his murdered sister some ten years earlier. It’s occasionally billed as a crime novel, but I think it’s more akin to literary fiction. Whatever you call it, it’s a terrific read — emotional, involving and thought-provoking. Bereft is set in 1919 in rural New South Wales. The Spanish flu epidemic is in full swing, and borders between states are closed to stop the spread of the contagion. But there is one child that Quinn does not frighten — and her name is Sadie Fox. She is 12 and has recently been orphaned. She’s hiding out in the hills in an old shack awaiting the arrival of her older brother who went to war. She befriends Quinn and urges him to hide out with her. That’s because Quinn can’t show his face in town — and it is nothing to do with the scar on his jaw. In the short prologue to this book, we learn that Quinn was accused of murdering his younger sister in 1909. But before he could be arrested he fled the town — and he has been on the run ever since. He knows that many of the townsmen, including his uncle and his father, want him to hang for the crime. To put things right, a decade on, he needs to get his mother on side and to confess to her what he knows. But his mother is now dying of influenza and has been quarantined in the family home. The only person who visits her inside the house is her doctor. Her husband, fearful of infection, is living elsewhere (he stands on the veranda and speaks to her through her open bedroom window when he visits). Quinn, feeling he has nothing to lose, slips into his mother’s bedroom and so begins the process of reconciling the past with the present. His mother initially thinks she is hallucinating — “You resemble my son” — but soon comes to realise that Quinn, thought dead on the battlefield (there is a telegram to prove it), has returned. Quinn’s tragic story then unfolds via a series of secret conversations with this mother and more personal conversations with bold-as-brass Sadie. And these, in turn, are interlaced with flashbacks to his terrible time at war, memories from his carefree childhood and the events that happened on the day of his sister’s murder. There’s a quiet, understated style to Womersley’s writing. But despite the restraint of his prose, there’s something quite moving about the way in which he depicts Quinn’s predicament, caught between wanting to clear his name and not wanting to hurt his mother, and all the while coming to terms with the terrible things he witnessed at war, the grief he still feels for his sister and the pain of being ostracised by his family. And his relationship with the mysterious, witch-like Sadie is beautifully captured. She’s a wonderful character — quirky and brave and resolutely independent — who doubles for the sister Quinn once lost. Of course, as with most Australian novels, the narrative is strongly tied to the landscape and there are vivid descriptions of the scenery and the wildlife and of the “crackle and hum of the bush”. But, for me, the book’s focus on the war and its personal aftermath is its greatest strength, because Womersley so perfectly captures Quinn’s sense of dislocation, his physical and mental torment, and his struggle to keep going when it would be easier to put an end to it all. 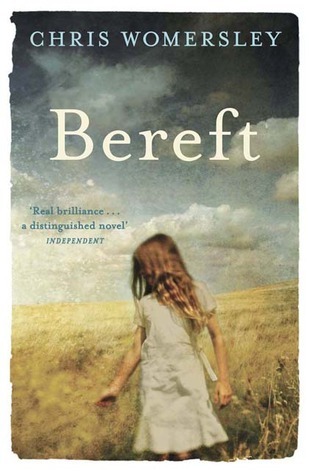 Bereft was longlisted for the Dublin IMPAC Award and the CWA Gold Dagger, and shortlisted for The Age Book of the Year, the 2011 Miles Franklin Award, the ASL Gold Medal for Literature and the Ned Kelly Award for Fiction. It won the 2011 ABIA Literary Fiction Book of the Year and the 2011 Indie Award for Best Novel. Another great review, Kim. This is a terrific book in so many ways, we had a great time discussing it in our book group. Ditto to Lisa, a great review, it brought the magic of the novel back to me. I enjoyed this book very much and I thought the quality of the writing helped make the distressing subject matter more palatable. I quite liked this when I read it earlier in the year. The characters and the setting are wonderfully done and I liked the slightly gothic atmosphere and how you start to question what is real or not but the lasting image I will take away from the novel will be those ‘talking’ ants. I really didn’t like the deus ex machina (deus ex Formicidae?) way Womersley used them to get himself out of the corner he’d written himself into towards the end, spoiling what could otherwise have been a powerful climax. I really, really liked this book. I think it cleverly straddles the crime/literary fences and is all the better for the elements it has of both. I certainly want to read more of his books. It has depth yet it keeps you reading and has a real pace. Sadie was a brilliant character indeed. She could have become too precocious in another authors hands but I felt Womersley wrote her, and her relationship to Quinn, impeccably. Thanks, Lisa. Yes, I can imagine this would be a good book to discuss in a group — there’s a lot going on in it. Oh, I think this sounds wonderful. Off to reserve it at the library! I really liked this book too, I thought it was so well written.